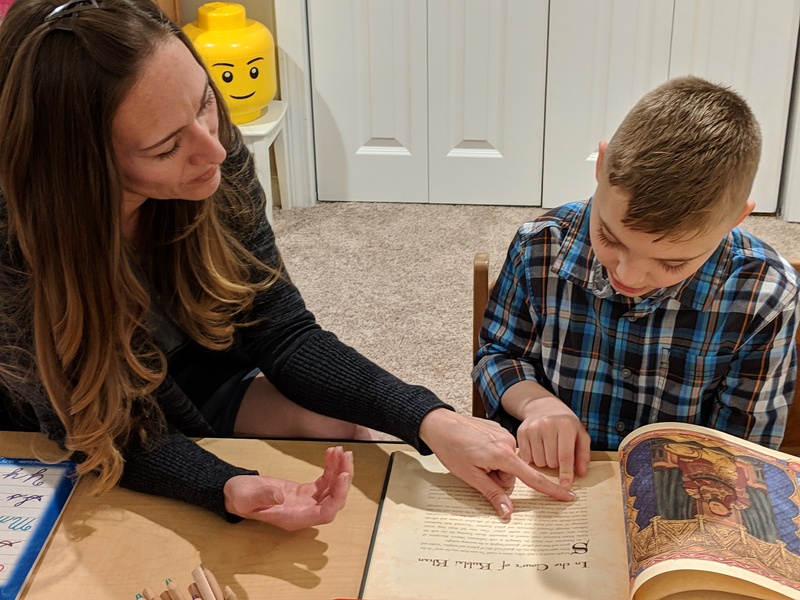 On a recent morning, Lina Schlotter sat at her granite kitchen counter in Simsbury, reading a child’s version of Shakespeare’s “Taming of the Shrew” aloud to her 10-year-old son, Tucker. Soon, he’ll be reading the bard’s original text, while also reading the works of Plutarch, “Pilgrim’s Progress,” and a biography of Marco Polo — all a part of Schlotter’s home schooling plan for her son. “We’re doing French right now, we do poetry everyday. We’re doing two math programs, natural history,” Schlotter said later as she flipped through the thick loose-leaf notebook where she has lessons plans for each day through the end of the year. Schlotter is so well-organized she already has many of the books that Tucker will need in high school. The academics are complemented by field trips to museums in Connecticut and Massachusetts, as well as nature walks and sports. So Schlotter, like the hundreds of home-schooling parents who made their views known to legislators this year, was relieved when last month the legislature’s Education Committee stripped Gov. Ned Lamont’s education bill of a provision that would have required home-schoolers to register annually with their school district. “I would prefer to have no regulation because I don’t need it,” Schlotter said, though she did allow there might be families who could use some help. However, while the provision is gone, the idea of requiring home-schoolers to register is not dead. In fact, at the meeting where Lamont’s home schooling provision was excised, Rep. Liz Linehan, a Democrat from Cheshire who sits on the Education Committee, said the decision to remove the home schooling bill made it more difficult for her to decide whether to support the governor’s bill. Linehan, who is also co-chairwoman of the Children’s Committee, later said of the proposal to register home-schoolers: “I hope it does come back. We are one of only 11 states without any regulatory framework for home schooling. Those are alarming words for home-schooling parents who believe that a plan to register their children won’t guard against abuse and neglect — one of the motivating concerns behind the legislation — and who worry that registering students is just the first step in a plan to further regulate home schooling. “Any time you put anything into law, you’re putting your nose under the tent, opening the door to increased regulation,” said Lucashu, noting that Connecticut laws currently are silent on home schooling. That contrasts with neighboring states — Massachusetts, Rhode Island and New York — that all have “high regulation.” Connecticut is one of 11 states without even a requirement that parents notify the state of plans to home-school, according to the Home School Legal Defense Association. States in Connecticut’s category include Idaho, Texas and Oklahoma. Other states have requirements such as an annual notification of plans to home school; records of a child’s progress and a portfolio of work; a description of curriculum; attendance records; and annual assessments. So how is it that Connecticut – a state frequently criticized for having too many regulations and unfunded mandates — has essentially no legal requirements for educating students at home? Thomas Mooney, an expert on education law and a partner with the Hartford law firm, Shipman & Goodwin, said he interprets the statute as meaning that “parents are obligated to show that their children are elsewhere receiving instruction equivalent to the studies taught in the public schools, so that’s not voluntary. It’s a statutory obligation that the State Department of Education has historically not enforced. “My view is that the state has abdicated its responsibility,” he said. 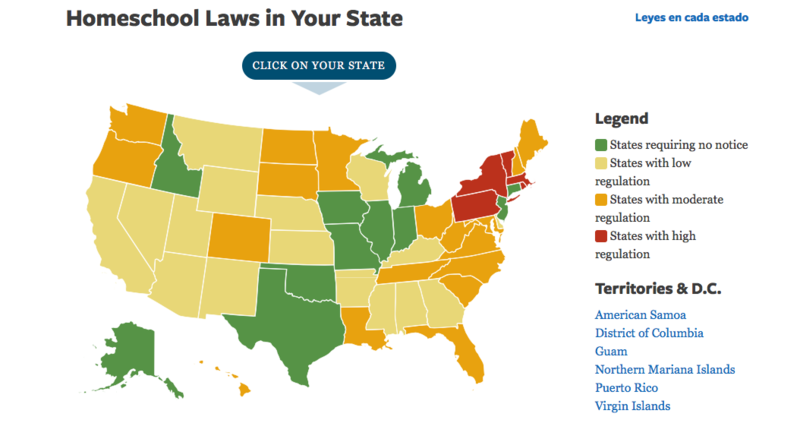 This Home School Legal Defense Association map shows how states regulate home schooling. Connecticut is among those with the fewest regulations. While the state does not require notification, it did provide guidance in 1994 recommending — but not requiring — that parents file “a notice of intent form” with their district providing basic information about their home instruction program. The state also provides a sample form with subjects listed — to be checked off yes or no — including reading, writing, spelling, English grammar, geography, arithmetic, U.S. History and citizenship. Timothy Connellan, superintendent in Southington said he has “notices of intent” from the parents of about 42 students, most of whom use the form suggested by the state and dutifully check off every subject box. But he questions the practice, as well as the proposal to make registration a requirement. By that, Connellan said, he means that the district has neither the power, nor the staff, to oversee what is or isn’t being taught to students at home. “I think there should be some sort of monitoring,” Connellan said, to ensure that students are receiving the education they need. But he says it should be done at a state level because districts are already overwhelmed with responsibilities. The proposal that home-schoolers register in person with school districts was tucked into Gov. Ned Lamont’s long and complicated education bill, which also included his controversial plan for school regionalization. The proposal also included a requirement that districts post “model curricula” for elementary school grades that could be used, if desired, by home-schooling parents. Sue Weisselberg, acting deputy secretary for the Office of Policy and Management, said the bill came out of conversations with state Education Commissioner Dianna Wentzell and education advocacy group leaders, including Fran Rabinowitz, executive director of the Connecticut Association of Public School Superintendents and others. “We were talking about different education issues and the issue of home schooling came up and that Connecticut had one of the lowest level requirements of any state around,” said Weisselberg, adding that local school officials sometimes have no idea how many children in their communities are being educated at home. “There was a sense that superintendents stated that they felt they are held accountable for the number of students who might at any time join the district for schooling, but they had no idea how many there were,” she said. But there was also another major reason that leaders, like Linehan, supported the provision, though Weisselberg said it did not prompt the writing of the legislative provision. That was a report on home schooling issued last year by Child Advocate Sarah Eagan after the death of Matthew Tirado, a 17-year-old Hartford teen with autism who died on Feb. 14, 2017 from starvation, dehydration and child abuse. In an investigation, the child advocate’s office found that Matthew, though enrolled in the Hartford Public Schools, had not been allowed by his mother to attend school for about a year before his death. The Office of the Child Advocate also reported that despite numerous reports by the school district to DCF alleging abuse and neglect in the Tirado home over the years, Matthew’s mother successfully withdrew his younger sister from school in November 2017 simply by filing a notice with the district that she would “home-school” the child. After Matthew’s death, DCF found no evidence that his sister was in fact being home-schooled. The Office of the Child Advocate decided to review information from six districts, including Hartford, to learn whether there were other children who were removed from school to be home-schooled and who lived in families that had a history of involvement with DCF due to reported concerns of abuse or neglect. The study showed that the six districts received notices of intent to home-school 380 students between 2013 and 2016 and that more than a third of the children who were withdrawn from school to be home-schooled came from families who had previous involvement with DCF because of reported concerns of abuse and neglect. If she had her “druthers,” Rabinowitz said, she’d like to see home-schoolers follow-up with districts and provide progress reports. “I felt like my hands were tied in trying to take a look at what was going on,” she said. 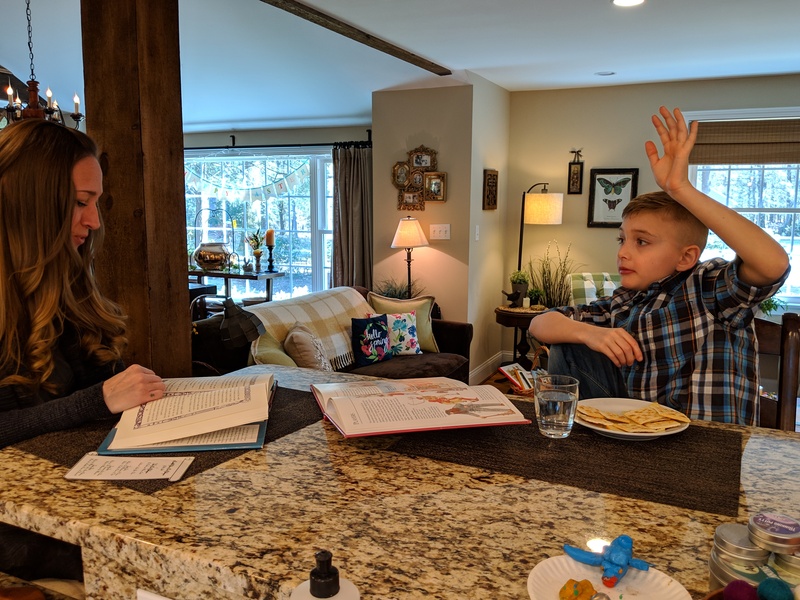 Tucker Schlotter has a question for his mother, Lina, as she reads to him from Shakespeare’s “Taming of the Shrew” during a recent home schooling lesson. It is the linking of the home schooling provision to Eagan’s report, and a fear that DCF might become involved with their families, that was particularly irksome for parents. Lucashu, legislative liaison for TEACH CT, agreed. “People who have removed their children to home-school and who have abused their children are not the people who are going to comply with any other regulations … The evidence suggests that children are best served when child services focus on identifying high risk cases and training their staff and focusing their resources there,” Lucashu said. Home-schooling parents also said they were disturbed that the proposal was tucked into another bill and that no one asked for their opinion. Rep. Bobby Sanchez, D-New Britain and co-chairman of the Education Committee, said it seems to him that the home schooling proposal was prompted by the Tirado case. Sanchez, who has two nieces who were home-schooled and are now in college, said a major problem with the most recent proposal is that it was developed without any parental input.